It’s back to school time. Labor Day weekend signals the unofficial end of summer and everyone is getting back to regular schedules. Whether you are in school yourself or have friends/children who go back, this blog post is dedicated to the lifelong learners. It offers a little running terminology 101. FARTLEK-A Swedish term meaning speed play, it is a training method that involves varying intensity. It’s what you’ll likely do at a track workout. You’ll run fast, faster, then slower, etc. It shocks your body and in turn, makes you faster. INTERVAL-This is similar to Fartlek. 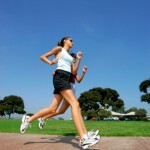 It is a faster pace of running that brings up your heart rate and challenges your body. TEMPO-Tempo is still a fast pace, but not as fast as internal. You’ll still run hard, but not with an all-out sprint. GEL-Packed into little nutritional packets, gels provide the necessary nutrition and calories you need to make it through a long run. Generally ranging from 100-110 calories each, gel packets come in different flavors and with or without caffeine to provide a little extra spike of energy. SPIKES-Running shoes with actual spikes on the bottom to help grip the track easier. These are made just for track runners—typically sprinters and short-distance runners. COMPRESSION SOCKS-Although they may look like soccer socks, long and pretty unusual, they are designed to compress the muscles. This allows for faster recovery and less lactic acid build up while running. LONG RUN-Distance runners generally include one or two “long runs” per week to build up endurance. These can last from six to 30+ miles, depending on what type of race the runner is planning to complete. MARATHON-Although the word “marathon” is pretty standard in the everyday language, many confuse the length. They assume any running event is a marathon. A marathon is 26.2 miles in distance and does not vary. A half marathon is exactly half that: 13.1 miles. Not all running distances are marathons—only those measuring 26.2 miles. LADDER-This is an interval workout of increasing interval lengths, i.e., 200 meters, then 400 meters, then 800 meters. PYRAMID-This is an interval workout of increasing and then decreasing interval lengths, i.e., 200 meters, 400 meters, 800 meters, 400 meters, 200 meters. You go up and then you come back down in equal distances. LACTATE THRESHOLD-This is the level of intensity that causes blood lactate to rise and muscle efficiency to fall with fatigue. The result? Lactic acid. This entry was posted in Uncategorized by jennifer.purdie. Bookmark the permalink.